One year. One year has passed since the release of my homepage and a blog article in which I described my goals and hopes for 2018. A year later I would like to look back but also look ahead because 2019 is fully underway and I am keen on what is about to come up in the future. A year ago I was considering a gear upgrade. Well, that was done fast with my Sony camera and is well documented in another blog post already. Back then I would not have thought that I would also add a drone to my gear arsenal. But ever since I added the Phantom 4 Pro Plus it literally has added another level of photography to me. In fact one of my goals last year was to get a decent publishing of my work. And so I did in the November edition of Chip Foto and Video magazine with a full two page display of my drone shot from Ra Gusela at Passo Giau, Italy. I saw other images get published in different magazines, too, so that worked out fine. And 2019 has just kicked off with a 2 page article written by me in issue number 2 of Chip Foto Video magazine topped by the fact that my Hamnoy image also made it to the cover of the magazine. Writing articles is something I started in 2018 in English and German. And it is much fun. It is something I want to continue in the future. And I am really happy that I have the opportunity to work as a freelance author for one of the largest photo magazines in Europe: Chip Foto Video. The platform most people probably know me from is my Instagram. I started 2018 with something above 7k followers. After reaching 10k follower in late February I set a personal goal to get 25.000 by the end of the year. I finished the year with more than 29.000. But something changed for me last May. In a 2 week time frame it appeared as if my account was secretly shut down. No reach of my posts, hardly any engagement and for the first time ever a resulting loss of followers. I googled words like “shadow ban” and ultimately had a mind shift. I had never used any bots or did the follow/unfollow tactic that I hate other people doing. But somehow or something made my account stall. This made me realize how useless trying to focus on one platform is. How much you depend on things outside of your control and how much is actually steered by shifting algorithms or whatever. I started to not care about numbers anymore. …well, everybody who says that still checks his numbers from time to time, but you get the point. (little side note, if you want to track your favorite Influencer and see some numbers or behavior of follow/unfollow check ninjalitics) I started to upload images that I knew would not be popular on Instagram (images of structures and detail, hardly any saturation or grand vistas). And I realized that the true asset of Instagram for me is the response of people I know do value my work. At times that’s why I even liked posting stories and chatting with people even more than posting another image to my gallery. Bottom line: Instagram is still the place you find me most active. And I am completely aware that it also enables me to continue my photography and travels. But I have no goals about numbers anymore. So in contrary to last year not even a secret one. My focus is staying in touch with my awesome community there and easily connect with like-minded. As long as that works, there is interest and a chance to collaborate with people and companies or organizations it is all fine. A year ago I had hoped to do well in one of the many photo competitions that are out. 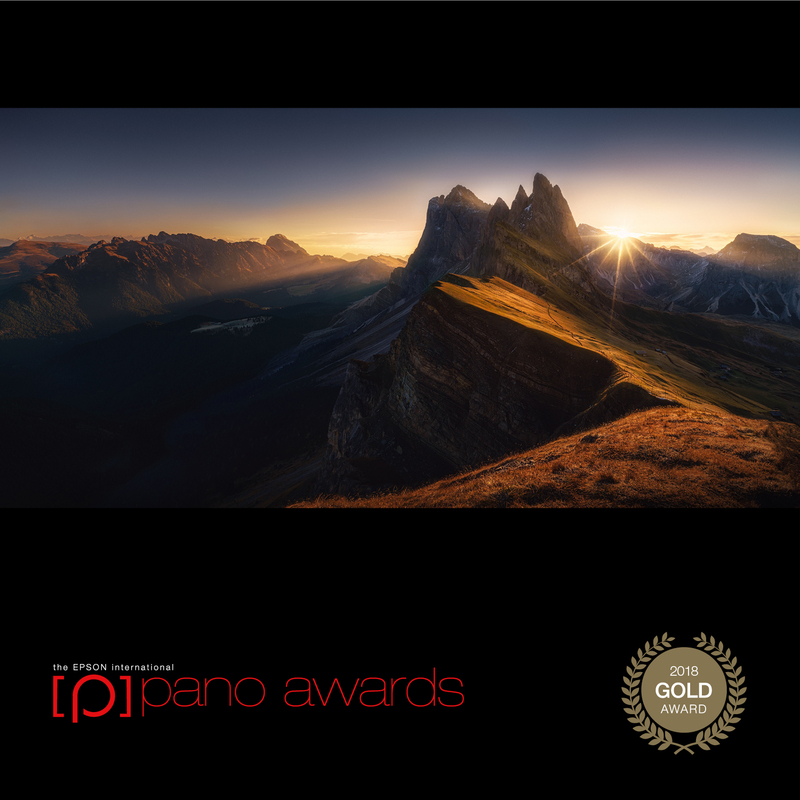 Besides the fact that you can seriously question the ethics behind many aspects of the competition industry, I earned a gold medal and a couple of silver at the International EPSO Pano Awards which is nice. I also won a couple of contests at Viewbug and Photocrowd. Looking back it was rather naive having a good contest result as a goal. But well, perspectives change and honestly yes I would still be honored to win in a big contest. But anyways, shifting subject now. What clearly is coming into focus is the business side of things. I like to shoot landscapes and travel to distant places. But that has a price. And a huge price tag it is. That is why I have gotten a tax number in 2018 and am now an official freelance artist/photographer who does photography aside my full time job as a human resources consultant. Working and collaborating with various companies and signing an ambassador contract with Haida is enabling me to continue my photography. It also leads to a different mindset and a different kind of responsibility. Delivering quality content on demand is different than just doing something or maybe not doing it as a hobby. But it is clearly a challenge I do embrace. And I would like to keep travelling and photographing like I did in 2018. Which is a nice segway into travelling: By the start of last year I would not have thought that I could add Iceland, Faroe Islands or Netherlands to the then already planned trips to Madeira and Lofoten. Not even mentioning the travels I did inside Germany. I feel so blessed having been able to visit all these amazing places. I will start off with a return to Lofoten, Norway. I had originally planned to co-lead a workshop there. But that was not to be (as a reminder that not everything goes as planned or hoped). So now I will be meeting up with photographers and just photograph what and how I want it instead of teaching at Lofoten. Tenerife is planned for later this year. Dolomites are up on my list again. And I am keen on returning to Iceland. That island has completely made me fall in love with its landscape. I have plans on going up in the air there and shoot some images from a plane and discover more of that country. Let´s see where 2019 will take me. One thing I would like to start with in 2019 is videos. I have been asked if and when I would have some videos out. In my Instagram stories I have already started vloging and since I don’t use my drone for photos exclusively I would like to do something with the clips I have recorded. Also teaching clients on how to process images via skype sessions has shown me that there is a lot of interest in learning a trick or two in editing images. All in all, plenty to do. Let´s get it on.